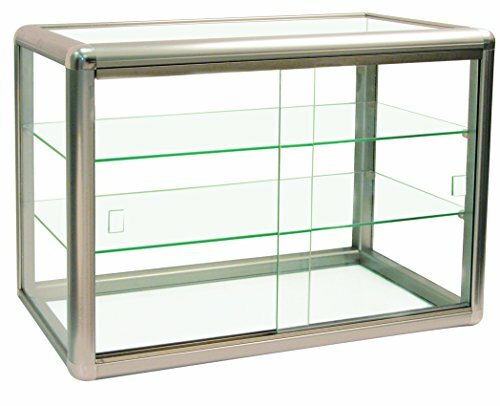 Tempered Glass Table Top Display Show Case- Silver Anodized aluminum frame. Sliding Tempered Glass Doors with key lock. Perfect for display a wide variety of products from vintage items, Collectibles to Fine jewelry and watches. Elegant Clean Design.Sliding doors and a keyed lock (keys included) make this display case as secure as it is beautiful. This case is perfect for displaying jewelry, hats, watches, and much more. You won't be disappointed with this classic counter-top display; it'll help you display your products in such a way that'll catch the eye of your customer. Elegant Brushed Matte Gold finish for the ultimate Boutique look. 2 Shelves with about 5 3/8" of clearance between shelves.